JACK ANSON 1921 - 2001. My father, intelligent, well-read, with a compendious memory and a real mathematics whizz, worked in coal-mining from the age of 14 for the next 22 years, eventually leaving the industry in 1962. Yet it still got him. He developed 'miner's lung' much later in life and was invalided by it several years before it finally killed him in 2001. I have two treasured, fragile, yellowing letters he received formally acknowledging his bravery in saving the life of a man who had had his arm ripped off in machinery underground. As well as him, my Mum's Dad, Bill Inwood of Golden Valley, also worked 'down the pit' and he only survived to his mid sixties. One of my brothers-in-law, Roy Chapman of Alfreton, worked at Pye Hill and Annesley; he's now in his early sixties and bearing the testimony of his years underground. My dad wouldn't allow me even to think of following him 'down the pit' - I remember him, on more than one occasion, threatening to "break my fingers" if I even suggested it, and was enormously proud and supportive of me in all I did, but never more so than when I finally took my Masters' at Edinburgh university. My Dad was near the scene when one of his work-mates got his left arm caught in the jib-end roller in the 65s in Swanwick (Morewood's) Pit. The result was that his arm was severed between the elbow and the shoulder. Dad immediately applied a tournique about the wound, using his belt. He also recovered the severed arm from the mechanism and, with it under his arm, wrapped in sacking, escorted the injured man to the pit-bottom for evacuation. At the pit-bottom Dad was actually upbraided for leaving his work without authority! He shut the officious official up by handing him the severed arm in its wrapping and explaining in graphic, blunt, terms what it was and what he could do with it! The man then became the second evacuee on the cage once he recovered from his fainting! Incredibly, Dad then resumed his shift and never mentioned it to any of the family. He never even let us know the contents of the two letters shown. We only found out by hearing of his actions from others in the village. There was no micro-surgery in those days so the arm could not be re-attached. Despite the extent of his injuries, the victim recovered, albeit never to work down the pit again. 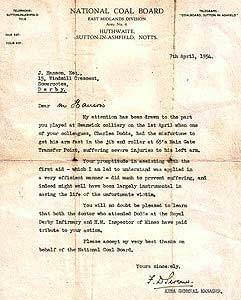 It's indicative of the class divisions and attitudes still pervasive throughout industrial relations of the time (only some 7 years after Nationalisation) that, despite Dad's actions, and the official recognition he received, they couldn't even get the spelling of his surname, or our street name, right!" "I was at the scene very shortly after the accident happened. I can only recall one accident such as you describe, a 60 year old man named Charlie Dodds. The accident site was at the top of a one in four incline, maybe a quarter of a mile long, called "2's jig".....The conveyor referred to was the main conveyor that brought all the coal off the 64s and 65s three-quarter seam faces. ('Three-quarter' referred to the height of the seam.....27 inches.....three-quarters of a yard). You had to be fit to work in there. Fit and a little bit crazy!!! Charlie had been cleaning out the spillage under the head end of the conveyor when the belt snagged his shovel. Instead of releasing the shovel he tried to pull it out and before he knew it he was in the conveyor. As I recall, he extricated himself and actually walked a couple of hundred yards to where your dad and others were working. Because the accident involved a conveyor, the underground foreman electrician at the time and myself went haring off up there to make sure everything was functioning correctly electrically before the Mines Inspector arrived. We passed the stretcher crew carrying Charlie out of the pit en route, and although I can't say that I recall your dad being on the crew, I'll bet the rent that is what the letter of commendation was about.....the speed with which they got him up the pit and to a hospital would be the deciding factor in saving his life. Ah, reading further I see he applied a tourniquet as well. Good for you Jack!! I still cannot believe that Charlie lived, having seen the amount of blood up there. I remember the bit about the arm being handed to (I think) Fred Eaton the overman in the pit bottom....."
My family finally received formal notification of the adjudication of the claim for my father's illness (and death) from the agency responsible. The claim could only be allowed for the period from 1956 to his leaving the pits in 1962, they said. 1956 was the date set down by the government legislation and seems arbitrary to say the least. Dad was assessed 82% disabled by the disease but, as he had been a smoker, (like almost everyone of his generation), it was decided that this was a major contributory factor and that, therefore, the claim would be reduced proportionately. I shan't bore you, suffice it to say that it was calculated that Dad ought to pay back £4,500 of the interim payment he had received but the agency magnanimously suggested that it would be unlikely that repayment would be demanded! I wish they had, it's three years after his death....maybe we should have invited them to contact him!!! 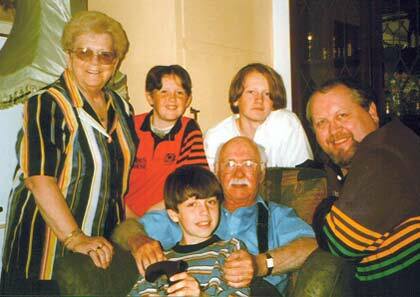 It's not the money for us, although Dad died thinking he would be leaving us a substantial legacy, eventually. For me it is the cold, analytical way this wonderful man's life, prolonged illness, and death - a life of exemplary service and incredible bravery and humanity - has been reduced by some faceless anonymous, pen-pushing, number-crunching suit in London to an accounting exercise!!! I'm glad Dad never lived to suffer this final insult!!! For the past seven years I have been involved in the research and preservation of certain aspects of the history and culture of coal-mining in Britain; my particular interest being folk song and music. I am the grand-daughter of the man whom your father assisted/rescued, Charlie Dodds. I am researching for more information about my family and was flabbergasted and well pleased to actually find an account of the accident. I intend, if I can collate enough information to write a history as my father, also known as Charlie Dodds, died in January of this year and I would like to dedicate it to him, and, I would be most grateful if you had anymore information. Could I also possibly have a copy of the letter your grandfather received? Do you have any details and dates and personal information on Charlie Dodds?